The 1.4-acre Ghurye Arboretum is nestled in the Marlin Hills neighborhood on Bloomington’s far north side. Charlotte Ghurye, who had lived in a house next door, left this 1.4-acre property to Sycamore Land Trust in her will along with a bequest for its stewardship. Ms. Ghurye always welcomed neighbors onto her land, and she wanted it to be preserved as a natural area in the middle of her neighborhood. The property is composed of a lot in the Marlin Hills subdivision on Audubon Drive and a small field behind, with a small stand of pine trees in between. 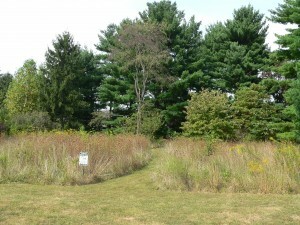 After receiving the property in 2004, Sycamore Land Trust decided to honor Ms. Ghurye’s intentions by creating a demonstration arboretum in the back field for recreational and educational use by the neighborhood’s families. The arboretum has a walking path and a sampling of 70 trees and shrubs native to Indiana, with pines for winter color. Many of the trees and shrubs have identification labels. 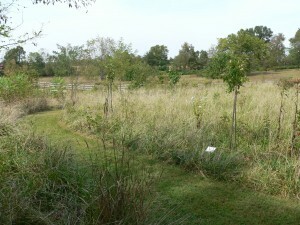 Volunteers planted the arboretum with seedlings from the Department of Natural Resource’s state nursery in the spring of 2006. Volunteer stewards who live nearby mow the walking trail and the road frontage along Audubon Drive several times each year, and tend to the young trees. Efforts to control non-native invasive plants are ongoing. The property has been recognized as a Certified Wildlife Habitat by the National Wildlife Foundation.